You can have the perfect mattress covered with luxurious sheets, but if your pillows don’t complement your sleeping style, then you’re never going to get your best night’s sleep. Do you need a soft, squishy pillow? Do you need something more firm? 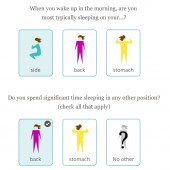 It all depends on how you sleep, and that’s what Slumbr is going to help you figure out. So, here’s a little back story: At least twice in my life (that I’m aware of, anyway), I’ve physically suffered from using the wrong type pillow when sleeping. I’m a side sleeper and for a period of time, I was using an expensive goose feather and down pillow that would flatten out during the night. Completely unrelated — I thought — was that I had this weird jaw ache that I was dealing with. It wasn’t just occasional, it was becoming chronic. My throbbing jaw was not only painful, but it was affecting my sleep. My dentist said I wasn’t grinding or gritting my teeth, so the source of the pain was a mystery. I was afraid I was going to need x-rays (or worse) to try to figure out what was going on. But then the answer presented itself. Oddly enough, during a long weekend that I spent with Gear Diary’s editors and our spouses at Dan’s old lake house, I realized a day or two in that the painful throbbing in my jaw had completely ceased. What had changed? I was now sleeping on a firm pillow — something I had never used in my life. Once I started sleeping with firm pillows, that pain never came back. Crazy, right? 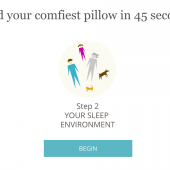 The second time that I’m aware of my pillow directly affecting my health was when I started using one that was too overstuffed and firm (yes, there is such a thing). I had started waking up with a sore neck and headaches, and sure enough — I deduced that it was because of my pillow, yet again. Which brings us to Slumbr. 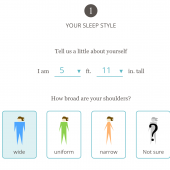 Rather than just turning you loose on their site with no idea which pillow that Slumbr sells might be best for you, Slumbr asks you a series of questions about your height, shoulder width, whether you sleep alone or with others, the firmness of your mattress, how many pillows you like to sleep with, and what your top two sleep positions are. 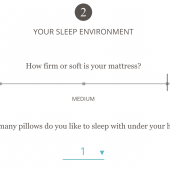 The last questions are about what’s important to you — whether you like a pillow that is high and thick, soft and fluffy, high and thick, scrunchable, breathable, hypoallergenic or back pain. The Slumbr quiz will highlight the pillows that are the best match for you based on your answers. As you can see, the recommendation for me was the Cassiopeia. 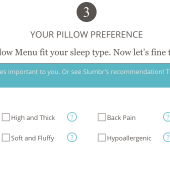 There’s also an option to allow Slumbr to choose a pillow for you based on your previous answers, and once again — my recommendation was for the Cassiopeia. The Cassiopeia arrived at a fortuitous time. 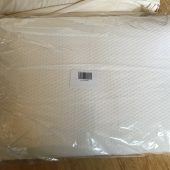 I had just determined that the overstuffed latex and foam pillow I was using (it was at least 5″ thick at all times) was causing my sore neck and headaches, and I was looking for a replacement. 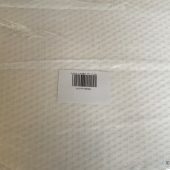 My Slumbr pillows (they sent me two) arrived in a cardboard shipping box with two reusable drawstring cloth bags inside. The pillows are also wrapped in plastic, which I have to admit worried me — what if I opened the plastic only to find out that they smell? 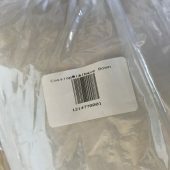 The last few latex and foam pillows I’ve bought that came wrapped in plastic also came with a chemical smell that took several days (in one case, over a week) to dissipate. I needn’t have worried. I was also a little bit thrown off by the fact that the pillows that arrived were standard size; I usually buy king size pillows; at this time Slumbr only sells standard size, but for a good night’s sleep I was willing to make adjustments (even if it meant an extra foot of unfilled pillow case material — oh well). I could tell right away that the Cassiopeia was a cushy yet firm pillow. At about 6″ thick, it was a little bit thicker than the pillow I would be giving up. Since the Cassiopeia is 100% down, I knew the down would compress and it would cradle my head. The trick was going to be whether it would flatten out on me while sleeping with it or not. Because it’s 100% down, it will settle and gently diminish in loft over time, like most beloved down pillows. But no need to worry about waking up overnight with your pillow flattening out, as can happen with feather pillows (given their quill shape, feathers will flatly settle on top of each other). 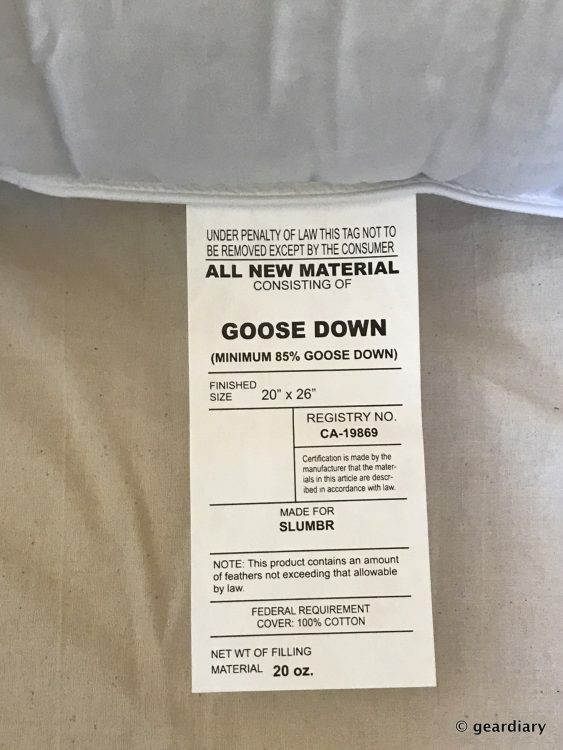 Because this is incredibly high quality goose down, from geese raised in ideal conditions, the down clusters will be larger, fluffier, odorless and will retain their durability longer (vs. other down pillows). 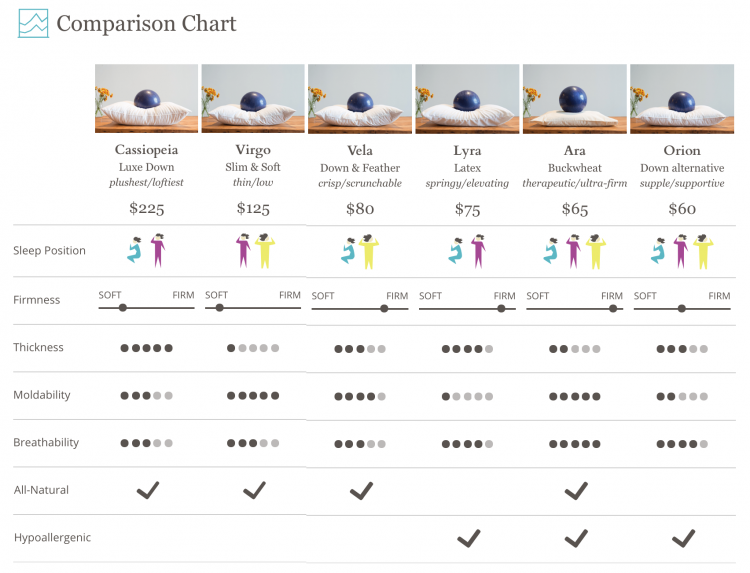 You can read more about the differences between down and feather pillows here. 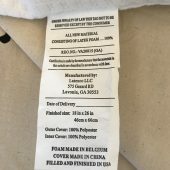 The pillows cover is made in China, the goose down is from Europe, and the pillow is sewn and filled in the USA. I’ve slept with the Cassiopeia for the last couple of weeks, and I absolutely love it. You know how 5-star hotels always have pillows that you wish you could bring home because you sleep so well on them? These are those pillows. When you lie on them, the Cassiopeia softly cradles your head; the pillow can be scrunched, folded, and hugged as you find your most comfortable position. The best news of all is that I no longer awake to a sore neck or a headache; the $225 Slumbr Cassiopeia is my new favorite pillow. 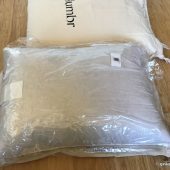 Slumbr surprised me by including an extra pillow in my shipment that they thought I might like, the Slumbr Lyra; Lyra is their “100% Talalay processed latex (a blend of natural and synthetic) pillow.” As I mentioned, I’ve purchased latex and foam pillows in the past that smelled like chemicals when I unwrapped them — there was no such smell with the Lyra. In the majority of cases, people do not notice a distinctive smell with our pillows after having them for a couple of weeks, and pillowcases typically mitigate any odors. Still, we realize some people will be sensitive to the smells of each fill. 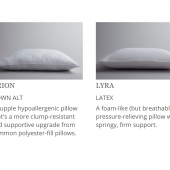 Our Lyra Latex pillow has the strongest odor when you initially receive it. We find that this smell will dissipate over time after airing out, but if you’re especially sensitive to smells, you may continue to notice a faint odor. Our Orion Down Alternative pillow is our most odorless, and most people will not notice any smell with our Virgo and Cassiopeia down pillows. You may notice a faint smell of feathers with the Vela down and feather pillow. Our Ara Buckwheat pillow has a fresh, woodsy smell, but this is often pleasant and clean. After you get used to this, you likely won’t smell the buckwheat hulls unless you open the zippered cover. The thing is, I didn’t notice any smell whatsoever when I opened the Lyra pillow (or the Cassiopeia, for that matter) — so if the Lyra is the one that might have the strongest possible odor — you should have nothing to worry about if smells are a concern. The Lyra has an open weave zippered cover that gives it increased breathability. The Lyra is soft yet firm; it provides “pressure-relieving support”, and because it is latex which never completely flattens. Unlike memory foam, your head doesn’t sink into the pillow, it nestles. The latex is springy yet firm; it’s not nearly as thick as the latex pillow I was using before (the one that gave me headaches), but it is high enough to support my neck and head when I’m sleeping on my side. While latex has a natural springiness, the Lyra’s firm texture is relatively less bouncy than other latex pillows. The Lyra is not overly high, but it does retain height that supports the neck, especially when side sleeping. This pillow was claimed by my daughter; she thinks it is fab. The $75 Slumbr Lyra is made in China, Belgium, and the USA. 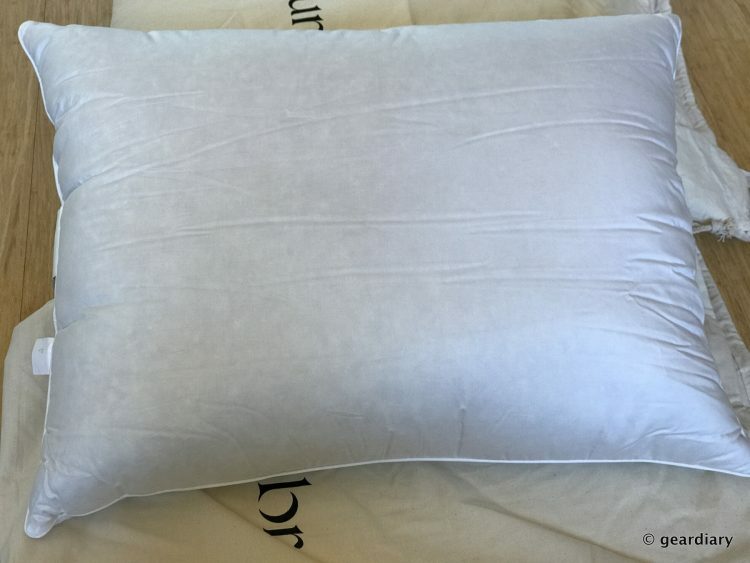 I have to admit that Slumbr’s prices gave me pause at first: the most I’ve ever spent on a feather pillow (king-size, mind you) was $150, and the most I’d spent on a latex pillow was $60 (also king-size). But here’s the thing: the longest I’ve had a feather pillow actually last before it basically flattened into a pancake was a couple of years, and the longest I’ve had a latex and foam pillow was two years before it started feeling squishy and dead. 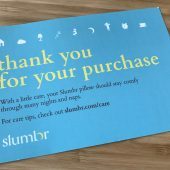 Slumbr says that discounted pillows made with lesser quality materials tend to “degrade, clump and flatten”, which leads to you replacing them sooner than you might one from Slumbr. 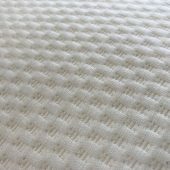 If you buy a Slumbr pillow, the initial outlay may be more, but since their pillows can last anywhere from 3 to 10 years with proper care, you’ll ultimately save money. 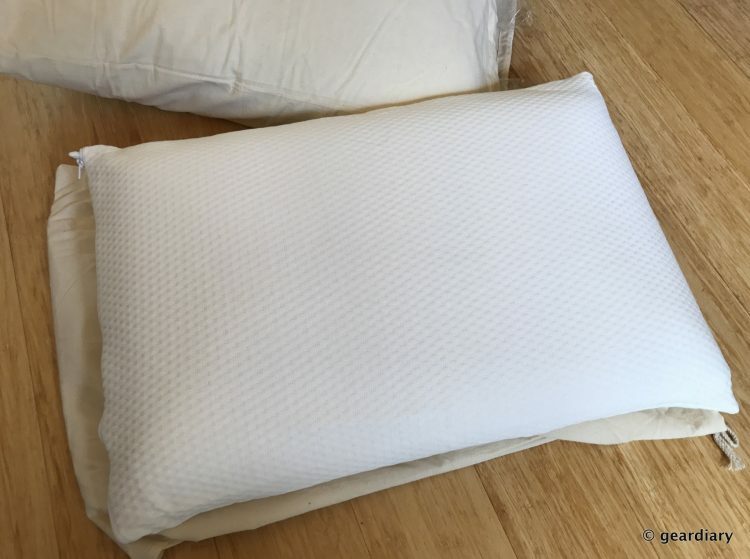 If you have bought a high-quality pillow (like one from Slumbr), with proper care and encased in a pillow protector, such a pillow can last you anywhere from 3 – 10 years. 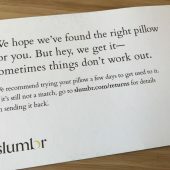 Even better, Slumbr offers a 30 day trial period; if you don’t love your pillow you can exchange it once. If you’re still not satisfied with the pillow purchase, return your order to us for a refund of the purchase price in the original payment form (minus a $15 return fee) for items purchased within 30 days. The $15 return fee covers return shipping and handling costs for up to 2 pillows. For every additional returned pillow, we charge $15/pillow. Click here for more information on why we charge a return fee. 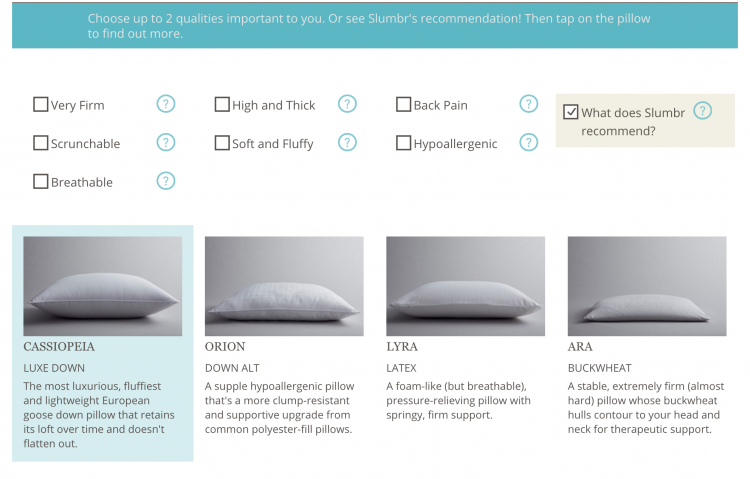 Better sleep and a higher quality pillow; if this is something you are looking for, then you should give Slumbr a try. 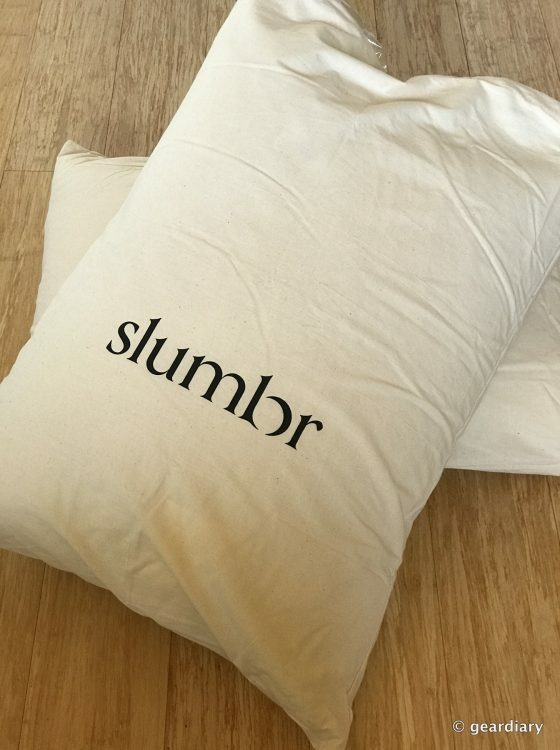 Slumbr pillows retail from $60 to $225, and they are available directly from the manufacturer.